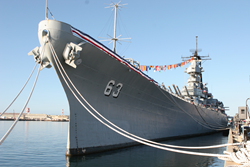 USS Missouri Memorial Association celebrates 20th Anniversary with special Mahalo admission rates for Hawaii residents and military members, March 15-31. The retired USS Missouri is berthed at Pier Foxtrot-5 in Pearl Harbor and open to the public as the Battleship Missouri Memorial. This Sunday, March 16, the USS Missouri Memorial Association, the nonprofit organization responsible for bringing the retired USS Missouri to Pearl Harbor and establishing the Battleship Missouri Memorial, celebrates its 20th anniversary. 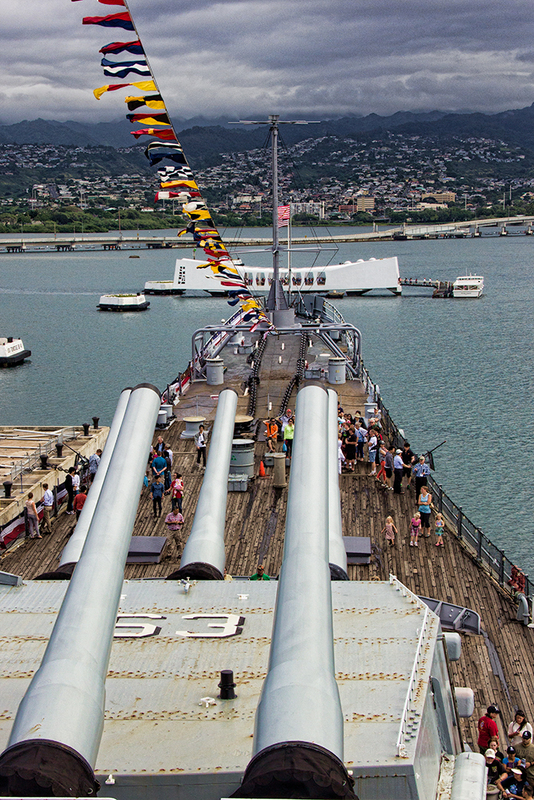 In honor of the Association’s anniversary, the Battleship Missouri Memorial is offering special mahalo admission rates to Hawaii residents and military members from March 15 through March 31. Two general admission tickets can be purchased for $20 total, and child admission tickets for $5 each (ages 4-12), a savings of 50 percent. Showing a Hawaii or military ID upon purchase is required. It was March 16, 1994, when the Association was founded with the objective of having the USS Missouri, the battleship where World War II ended, berthed bow-to-bow to the sunken USS Arizona, the battleship signifying the war’s onset for the U.S. Twenty years and nearly six million visitors later, the vision of the original board members, Chairman Edwin Carter, the late Harold Estes, ADM Ronald Hays USN (Ret. ), Fred Hemmings, and Captain Michael Lilly USN (Ret. ), has been fulfilled and continues to grow. The transformation of the “Mighty Mo” over the past two decades has been remarkable and inspiring. Twenty years ago, the decommissioned USS Missouri was rusting, badly in need of repairs, and seen by relatively few people while stored at the Naval Inactive Ship Facility in Bremerton, WA. Instilled with the conviction that Pearl Harbor was the nation’s most appropriate final home for the Missouri and that a permanent memorial could be created honoring America’s Armed Forces, the Association’s board of directors set out to make their vision a reality. With the support of the late-Senator Daniel Inouye and a “Who’s Who” list of Hawaii’s business leaders, the Association put their plan into action. From 1994-1998, the Association went to work to bring the USS Missouri to Hawaii, a monumental task considering the gigantic battleship stretches three football fields long, stands 20 stories tall from keel to mast, and weighs 45,000 tons. A detailed proposal of the Association’s plans was presented to the Secretary of the Navy. A $5.5-million line of credit was secured from a consortium of Hawaii banks, led by Bank of Hawaii, to fund the battleship’s relocation until the planned memorial could begin generating revenue. Roy Yee was retained as President and performed a stellar job at keeping the entire project on track, while making the most of limited resources. A skeleton crew of employees, each with a specific skill set needed to complete the Missouri’s relocation and establish a self-sustaining historical attraction, were hired. Hundreds of volunteers were recruited to help with repairs and ongoing maintenance. On May 4, 1998, the U.S. Navy made it official, donating the USS Missouri to the care of the USS Missouri Memorial Association. Seven weeks later, on June 22, 1998, the Mighty Mo was towed into Pearl Harbor and moored at Pier Foxtrot Five, the 1,000-foot pier that has been her home ever since. On January 29, 1999, seven months after its arrival and 55 years to the day of its launch, America’s last and most famous battleship opened to the public as the Battleship Missouri Memorial. Where the Association at the outset had a handful of staff working in makeshift offices, today there are 153 employees and countless volunteers caring for the Mighty Mo and creating memorable tour experiences and exhibits for the public’s education and enjoyment. Four of the Association’s “founding” employees who started before the Missouri opened to the public are still serving the Memorial today: Tom Manuel as Vice President and Chief Financial Officer; Les Lancaster as Director of Ship Operations; Ralph Schmidt as Chief Machinist, and; Mike Weidenbach as Curator. Today, thousands of visitors from around the world experience the Mighty Mo each week as they tour the main and upper decks and throughout the interior to see historical exhibits and get a first-hand glimpse as to how crewmembers lived and worked while at sea. The most popular site is the famed Surrender Deck where General Douglas MacArthur, Admiral Chester Nimitz and the Allied Forces accepted Imperial Japan’s surrender to end World War II and restore peace on September 2, 1945. In 2013, the Battleship Missouri Memorial enjoyed its most successful year to date with more than 580,000 paid visitors, a record total. In addition, the Mighty Mo hosted more than 1,000 special events and ceremonies, including re-enlistment, promotion and retirement ceremonies for Armed Forces members. Just as the Association’s founding board members envisioned, everyone who tours the USS Missouri is moved by how it stands watch over the USS Arizona, a lasting bond of sacrifice and service in Pearl Harbor. The Battleship Missouri Memorial is open daily from 8:00 a.m. to 4:00 p.m. General admission, which includes choice of an optional tour, is $25 per adult and $13 per child (4-12). Military, kama‘aina (local resident) and school group pricing is available. For information or reservations, call (toll-free) 1-877-644-4896 or visit USSMissouri.org. The Battleship Missouri Memorial, located a mere ship’s length from the USS Arizona Memorial, completes a historical visitor experience that begins with the “day of infamy” and the sinking of the USS Arizona in Pearl Harbor and ends with Imperial Japan’s surrender aboard the USS Missouri in Tokyo Bay. Following an astounding career that spans five decades and three wars, from World War II to the Korean conflict to the Liberation of Kuwait, the “Mighty Mo” was decommissioned and donated to the USS Missouri Memorial Association, Inc., a 501(c)(3) non-profit organization, which operates the battleship as a historic attraction and memorial. The Association oversees her care and preservation with the support of visitors, memberships, grants and the generosity of donors. The USS Missouri is berthed bow-to-bow to the sunken USS Arizona in Pearl Harbor.